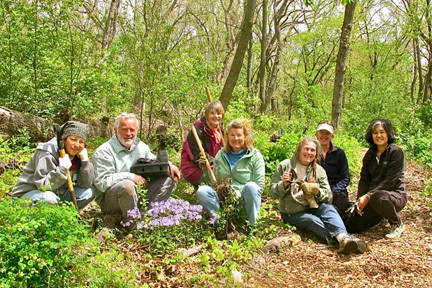 The Friends of the Lakeshore Nature Preserve is a non-profit membership organization that supports the Preserve in myriad ways: through volunteering, fundraising, stewardship projects, and interpretive programs. They offer excellent free guided field trips and nature walks and maintain a rich and extensive website that is well worth exploring. Friends volunteers take a break from planting in Bill’s Woods. Photo by Bryn Scriver. Inspire people to connect to and care for the Lakeshore Nature Preserve.